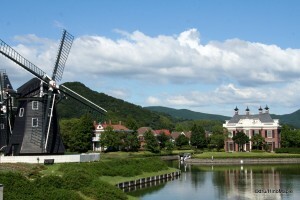 Huis Ten Bosch is a theme park located north of Nagasaki near the town of Sasebo. 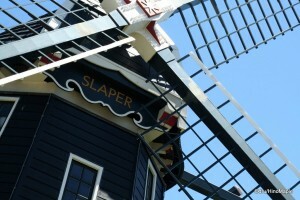 It is a Japanese theme park that replicates a typical looking Dutch town. They have obtained permission to recreate in full form the Royal Huis Ten Bosch Palace in the Netherlands. 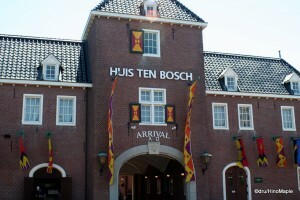 Literally translated from Dutch as “House in the Forest”, Huis Ten Bosch is far from that. It’s a typical Japanese theme park that has recently been updated, but still less relevant to those looking to see what I’d call, “Japan”. Being a Dutch theme park, you would be hard pressed to see anything in the area that relates to Japan. You won’t be seeing any temples or shrines, nor will you see much in the way of Japanese products. The entrance into the park itself is like going to Disneyland. You pay an admission fee, and then you decide whether to pay extra for a passport pass or individual “ride” tickets. Even from the outside, the entire theme park is pretty impressive. While most of the park is not viewable from the main entrance, you can still see various interesting Euro styled buildings outside. You will not feel like you are in Japan, aside from the hundreds of Japanese people walking around. It is rare to see any Europeans at Huis Ten Bosch, and it’s unlikely that you’ll see many foreign tourists from other places, aside from other Asian countries due to the theme of the park. While that is said, if you don’t have plans to visit Europe, it’s still a nice place to visit while in the Nagasaki and Sasebo region, but I wouldn’t go as far as to say you must visit this theme park. 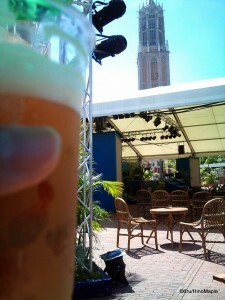 There are several great things about Huis Ten Bosch. The gardens are one of them. At the main entrance, there are several gardens lining a canal system that is used for boats that transport you from one end of the park to the other, and also serves as a nice tour of the park. These boats ply the waters up and down all day taking tourists for a nice scenic adventure. I would probably avoid this and enjoy a nice walk through the park instead. There are several points of interest located throughout the park. After passing the canal system, you’ll be in the “village” areas. The first village area is full of regular shops selling local Sasebo and Nagasaki goods. Being in Huis Ten Bosch, you will be inundated with the prospects of buying cheese and chocolate. These are the two most popular items available. Cheese is famous in Europe and being a Dutch themed park, they have a variety of European cheeses for sale. It’s also popular to buy chocolate as most Japanese cities are famous for their own take on one of the most popular deserts in the world. Unfortunately, I don’t think it’s that special, so it’s unlikely that you’ll get anything out of it either. While the cheeses and chocolate are delicious, you will be paying the import premium on European cheeses, and the theme park premium on domestically produced goods. As you continue through the park, you will come towards the hotel district which borders the opposite end of the park. The park itself has two entrances, one for trains and buses, and the other for ferries. The ferry entrance is located in the back. Do be aware that as you pass the hotel district, you will come to a gate where you will exit the admission area of the park. You are required to show your ticket upon re-entry. Once you pass this gate, you’ll be in a more historical looking area of Huis Ten Bosch. This is the port area of the park where you can see various tall ships docked at the port, and several shops that are housed in what appears to be old brick factories or warehouses. They are generally new buildings with an old facade, but it is a nice place to visit with various quirky goods to be had. It is also in this area that you can visit the Huis Ten Bosch Palace. While I didn’t actually enter the palace, it did look nice from the fence. Aside from a walk through the park itself, you can purchase a passport pass, or individual tickets for various attractions. This is a family theme park, so expect family oriented activities and attractions. 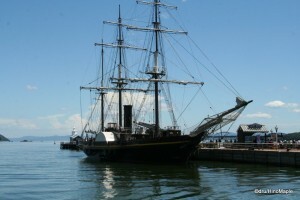 The activities and attractions range from theatres, to museum pieces. When I visitied Huis Ten Bosch, there was a 3D art project where 3D images were painted on walls, as well as a mirror maze. Each attraction is roughly 300 to 500 yen per attraction, but I doubt it was worth the price for individual tickets. I entered the mirror maze for 300 yen and was disappointed at how short it was. For 300 yen, I was funnelled through in about a minute. It looked old inside and I didn’t get lost at all. There was roughly one easy route through the maze, and the only people who would have trouble are kids. I ended up doubling back in an attempt to get my money’s worth. It helped a little, but unfortunately, it isn’t worth more than 100 yen. If you do decide to go to any of the attractions, think about buying a passport. Paying for each attraction individually is not worth it. If you visit all of the attractions, you can expect to spend all day looking at stuff. You might even need two days to see everything available to you. If you have children, this will be a great place for them to just see and do all sorts of things and have fun at the same time. In terms of food, Huis Ten Bosch has a lot of interesting things to choose from. During the summer months, you can get a Sasebo specialty, the Sasebo burger. Do beware that a Sasebo burger has no specific specification as to what it is. It’s basically a basic burger with various things inside, but made in Sasebo. Some are delicious, others are not. You may end up being disappointed in the end. There are also various desert shops for the typical cakes and chocolates. As I mentioned, one of the more famous foods to eat is cheese. Wherever you go, you will be able to find shops selling cheese that is direct from Europe. Huis Ten Bosch also has their own brand of cheese, which isn’t cheap either. If you are in Nagasaki, and going through the airport, you rest easily if you are hungry for Huis Ten Bosch cheese as you can buy some at the airport. The other famous cheese related food is a type of cheesecake. There is a special local version of baked and rare cheesecake that is very delicious. If you have the chance, I’d recommend trying it out. When I went to Huis Ten Bosch it was the middle of summer. It was hot and a little humid, so keeping hydrated was important. Thankfully, I found a nice outdoor area near the hotels where I could buy a nice ice cold beer and relax for an hour. Whether this is a permanent area for food or not, it’s a great place to relax and it feels as if you are in a European plaza. As I mentioned, Huis Ten Bosch is not a place for everyone. 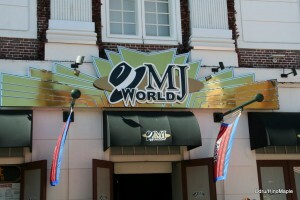 It’s a great place to take a girl for a date, and great for families. A single day at this park is more than enough for most people, but many Japanese tour books recommend spending at least two days. In order to see all of the free sights, you don’t need two days. If you are from North America, or Europe, you probably won’t care much for it. It is very picturesque and I took hundreds of pictures while I was there. I loved the buildings and the cleanliness of the entire park. However, I probably wouldn’t return again. Instead, I’d probably head a little farther north and visit Sasebo instead. I’m assuming it would be a lot nicer, definitely cheaper, and a lot more fun. This entry was posted in Kyushu and tagged cheese, cheesecake, chocolate, Dutch, Holland, House in the Forest, Huis Ten Bosch, japan, mirror maze, Nagasaki, Neatherlands, Sasebo, Sasebo Burger, Tall Ships, theme park, オランダ, テーマパーク, ハウステンボス, 佐世保, 日本, 長崎 by Dru. Bookmark the permalink. Sasebo is shite. However, the 99 islands around the corner is wonderful. You say people from North America won’t care for it but we don’t have that sort elaborate/18th european atmosphere or buildings in N.America either, most cities in N.America have boring modern ugly buildings except for a few Victorian homes but that is about it. And for people who blew all their money to move to Japan (as its expensive to fly and move to Japan) who cannot afford to go on a long expensive flight to Europe (since Japan is polar opposite from Europe) it might be a nice way to visit a faux European theme park like this XD I would say though that to Europeans they wouldn’t care for this park but maybe a few N.Americans who are living in Japan long term might like to visit at least once. I think there are some nice old European style places in N. America, but I would imagine most of it is on the east coast of the US or in Quebec. I have yet to see such a high concentration but there are some nice buildings here and there. Lastly, if you blew all of your money moving to Japan, I think a visit to Nagasaki is the least of your worries. 😉 I do believe that it is cheaper but you can’t compare a European theme park for the real thing. Also, I tend to “blow my money” on trips back home rather than to Europe, but Europe is still in the cards. If you live in Japan long term, you should be able to save up enough to visit Europe. To me, nothing beats going to the real thing. I know what you mean by having a good place to visit that isn’t too far is a lot better though. I don’t really like long flights and I can imagine what a rough landing would do for your mind. I’m generally not scared of flying but only because I know what is happening at every moment in the flight. Going to the west coast is pretty easy from Japan. So many options and the time is pretty quick. Europe, at least Scandinavia, isn’t so far either. Personally, I’m not afraid of Ebola. I have a higher chance of dying in some car accident than getting Ebola. Plus, Ebola was only in Spain? Chances of catching it is pretty slim.